Normally, I am not a big fan of black and white movies. But the fact that Frantz was made by acclaimed French director François Ozon still made me want to see it. After all, I loved his previous films Swimming Pool (2003), In the House (2012, and Young & Beautiful (2013). It’s the year 1919 somewhere in a small‐town in Germany: A young woman called Anna (Paula Beer) is grieving the death of her fiancé Frantz (Anton von Lucke). Previously, Frantz had been sent off to war even though he was a pacifist at heart, more interested in music and fine art than any sort of fighting. But patriotic spirits were high during the first years of WW1 and so Frantz had reluctantly joined the army according to his father's wishes. After the death of Frantz, Anna continues to live with her in‐laws – Frantz' parents – whom she is very close to. One day, Anna notices that a mysterious Frenchman called Adrien (Pierre Niney) has recently put fresh flowers on her fiancé's grave. Adrien then tells Anna and Frantz' parents that he had befriended Frantz before the war in Paris. Back then, the two men apparently visited museums and played music together. Some scenes of Frantz were shot in France (for example at the Musée du Louvre in Paris). The majority of scenes was, however, filmed in East Germany. Director François Ozon chose the UNESCO World Heritage town of Quedlinburg as well as Wernigerode and Görlitz in East Germany to recreate the 1919 set for Frantz. "In contrast to West Germany, most towns in the former GDR are perfectly preserved from the pre‐WW2 period,” he explains his choice of filming locations. 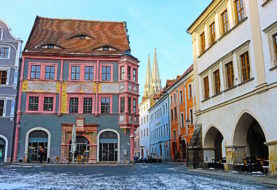 The well‐preserved German town of Görlitz is particularly popular with film production teams looking for authentic historical outdoor sets. Big screen productions that have been largely filmed in Görlitz include Quentin Tarantino's Inglorious Basterds (2009), George Clooney's WW2 drama The Monuments Men (2014), and Wes Anderson's The Grand Budapest Hotel (2014). The period films The Reader (2008) and The Book Thief (2013) were also filmed here. Newcomer Paula Beer (Anna) was only 20 years old at the time of filming, but director Ozon sensed that there was already something very mature about her. The leading male role of Adrien was portrayed by French actor Pierre Niney, who had impressed me previously as the famous, but troubled French fashion designer Yves Saint Laurent in the biopic Yves Saint Laurent (2014). This film was quite a challenge for Niney, because in addition to learning how to pronounce his dialogues in German, he also had to learn how to play the violin and how to dance a waltz! A little anecdote at the end: "The name 'Frantz' almost sounds like an echo of France," says Ozon. "In German, it's spelled without the 't'. It's a typical mistake that French speakers make. But the Germans liked that, so I left it. I'd like to think that the art lover Franz added the 't' in order to express his love for France." Even though I initially found that the film lacked a bit of pace, I was soon hocked as to what would happen next. Overall, this was a truly mesmerizing drama with an unexpected twist after the first half! check out this film list for my Top 5 of the Most Powerful Anti War Films.